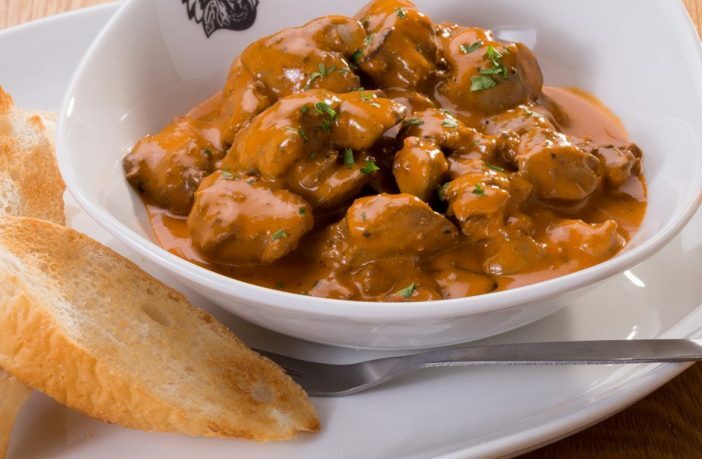 You are at:Home»Lifestyle»Food & Drink»This Recipe for Creamy Chicken Livers with Bacon & Beer Bread is a Winter Winner! Listen, we know the chances of having leftover beer aren’t very high but sometimes you may have a can or two after a party that you don’t know what to do with. This amazingly yummy recipe from Chef Peter Ayub for a Bacon and Beer Bread with Creamy Chicken Livers is the answer to your leftover beer worries! Place into the bread pan and bake for about 30-40 min at 180°C until golden brown. When you tap the bread you should hear a hollow sound. Add the dissolved cornflour and stir in until the sauce thickens slightly – so that it coats the back of a spoon. Serve immediately with your freshly baked bacon and beer bread and plenty of butter. Chef’s Tip: This bread is so good and incredibly easy to make – and sure to impress your mates! And you can change the flavours, of course, the larger is the key ingredient! But you can use different herbs, sun-dried tomato, Spring Onions, Feta Cheese etc. Want more great beer-centric recipes? Buy great beer cookbooks online via PriceCheck now! While you’re in the kitchen why not also impress with your guests with this Foolproof Recipe For Twice Baked Soufflé?